"What is a material 'climate solution' in [Vinod] Khosla's world?" That's one of the things Tyler Hamilton asks Khosla, founder of Khosla Ventures and a long-time partner with venture capital titan Kleiner Perkins Caufield & Byers (and one of our favorite social capitalists in his Toronto Star column today. The answer: "What's clean, cost-competitive, can be deployed on a large scale and is capable of dramatically reducing greenhouse gas emissions?" Among the other insights Tyler shares: "Khosla more or less divides clean-technology investments into two camps: those that can make real but relatively small changes and those that can make huge changes to the world's environmental problems, most notably climate change. "'There's a difference between a good green investment and a climate solution,' he told me last week in an interview. 'I came into it from the point of view that asks what the large solutions are that actually matter to climate change. "'I love PV (solar photovoltaics), and we have investments in PV, but I don't think it will be relevant to climate change in the next 20 years.'" We have to stop playing with toys, Khosla tells Hamilton, who is also author of the Clean Break blog. "Khosla, in addition to his other green investments, is placing a big bet on solar-thermal technology – what he considers the best weapon in the 'war on coal power generation.' To a lesser extent, he's also increasingly drawn to the potential of enhanced geothermal power. "'Solar thermal has been ignored completely in favour of sexier photovoltaics,' he says. 'When I started looking at solar thermal early last year, I couldn't find anybody who was paying attention, which sort of surprised me. It's a great technology, and about one-fourth the cost of PV with the kind of reliability that utilities actually like.'" "By solar thermal," explains Hamilton in a sidebar, "Khosla is referring to concentrating solar power, as opposed to solar thermal technologies used to provide space heating and hot water in buildings, or conventional solar power, where the sunlight strikes a PV cell and is converted into electricity. "Concentrating solar power uses parabolic mirrors to focus the sun's energy on a single point, creating high temperatures that generate steam from a fluid. The steam spins a turbine, just as it would in a coal plant, which in turn generates electricity." Khosla is also ahead of many others in his consideration of another important investment area: next-generation, ultra-high-voltage DC transmission technologies and infrastructure. To Khosla, suggest Hamilton, "getting off coal and other fossil fuels means playing to our clean-energy strengths and connecting our energy sweet spots to a large, trans-national grid that can efficiently carry power over long distances." This irks many extreme greens -- and bothers some NIMBY opponents of big alternative projects. But it is a solution that needs to be investigated and invested in. The global economy will be fueled by over US$20 trillion of spending on energy over the next two decades and this week's round of talks on global warming, which begin today in Vienna, Austria, will focus on how to make that investment as green as possible. "We need to 'climate-proof' economic growth," said the UN's top climate official Yvo de Boer yesterday. The UN Framework Convention on Climate Change believes additional investments of about US$210 billion a year are necessary to maintain greenhouse gas emissions at current levels until 2030. More than 1,000 delegates from around the world will gather to talk about how best to ensure energy investments will contribute to reducing emissions rather than adding to it. "The war against climate change is not a war against oil," De Boer said, recognizing that the world will likely be dependent upon oil and coal for many years to come. "It's a war against emissions." The goal should be to find every way possible to reduce those emissions, increase efficiency, and catalyze investments in alternative energy, carbon capture, such as sequestration, and making what fossil fuels we do continue to use be more clean and efficient. I've often been critical of the UN-led discussions for being nothing more than hot air. Let's hope this meeting and the others leading up to the climate summit in Indonesia this December will have concrete and economically viable outcomes. Next month's Wired Magazine features a piece by David Wolman on efforts by "eco-capitalists" to create new markets for the life-sustaining services provided by Nature. That's right. Call it natural capital, ecosystem services (see my earlier post on that subject), environmental markets, ecological assets, or as my former colleague John Kinch and I coined it, ecosystem benefits. Whatever. These are the services provided by nature free of charge -- or free until now. In an effort to create viable markets for such services as clean water, storm surge protection, and greenhouse gas build-up, people like David Brand, founder of New Forests Pty Limited, and Priceline.com cofounder Jessie Fink, among others, "are betting that successful trading of carbon will kick-start the creation of other cap-and-trade systems for ecological services like watershed protection, biodiversity, and erosion control." Global Climate Change: Idean Salehyan's "The New Myth About Climate Change"
This from YaleGlobal Online: Global warming is a serious problem and could result in a decline of basic resources such as water or food in some regions of the world. But Idean Salehyan rejects the notion that climate change will necessarily lead to civil wars, uncontrollable immigration and global violence. Global leaders can muster a strong response to climate change, reducing carbon emissions and adapting to changes. Salehyan also offers the reminder that abundant resources often lead to conflict more so than scarcity. People are responsible for their reactions to scarce resources. The world is fortunate to have plenty of fair warning about climate change, and governments can take action to cooperate or compete. As Salehyan concludes, "Yes, climate change is a serious problem that must be addressed, and unchecked environmental degradation may lead to intensified competition over scarce resources in certain regions. The good news is that the future is not written in stone. How governments respond to the challenge is at least as important as climate change itself, if not more so." China will soon create its first national park in one of the most biodiverse regions of the world. Pudacuo National Park will contain more than 20% of the country's plant species, about one-third of its mammal and bird species and almost 100 endangered species. Provides economic benefits to local communities through park-related jobs and ecotourism. The Conservancy supported the Chinese government's efforts to establish Pudacuo in June 2007 by introducing the concept of the national park system to officials and advising the government on how best to establish this kind of protected area. And on a personal note, how cool is it to see the impact of your words halfway around the world? “What…distinguishes this park [from a typical Chinese nature reserve] is that the local communities are already benefiting from it because they are preferentially employed for jobs within the park,” says Zhu Li, communications manager for the Conservancy’s China Program. “The national park system embodies the conservation ideal of ‘nature for people’ rather than ‘nature from people.’"
In the preamble to TNC's 2005 Annual Report, Nature for Life, I wrote: "Conservation today is about conserving lands and waters for people, rather than protecting nature from people." Cool to see one's words carrying over the world and transforming the way we think about conservation, to connect people and nature in new ways and articulate the interdependency between nature and human well-being. Global X continues his series of short video interviews with social entrepreneurs. This time, Mathias Craig, one of the founders of blueEnergy, which provides low-cost, sustainable solution to the energy needs of marginalized communities through the construction, installation and maintenance of wind turbines and hybrid wind and solar electric systems. We all have questions we need to ask of ourselves, others, and our businesses. But what are the right questions? "Is this a Dip, a Cliff, or a Cul-de-sac?" "What chance does this project have to be the best in the world?" "Are you avoiding the remarkable as a way of quitting without quitting?" These are questions I wrestled with recently in thinking about my old job versus my new opportunity. When I could answer those questions, I made my decision. 1. What change has been affected by our actions and strategies? 2. What places are protected that may have been lost? 3. Whose lives are improved? 4. Why could the change not have happened without us? I still think they are the right questions and, slightly tweaking the second one, are adaptable to any business. 1. What do I care about enough to dedicate my time and money to? 2. Who can help me do it? 3. How do I know if they are doing a good job? 9. Pribilof Islands, Alaska: We've flown from Anchorage to Dillingham. At Dillingham we are to board a plane to the Pribilof Islands, in the middle of the Bering Sea, famous for its fur seals, bird life, and spectacular yet difficult existence. From Dillingham, you have a fifty-fifty chance of getting to one of two islands: St. Paul or St. George. The pilot says we will be landing on St. George today, because a thick fog has stationed over the other island. A sigh of relief comes from the woman seated next to me; she's a school teacher and has been trying to get back to St. George for a week, each time disappointed. We fly but about 3/4 of the way there the pilot informs us that the fog has shifted over to St. George and we will now land on St. Paul. My seatmate is visibly shaken by this news, but a few moments later, she is resigned. We are over open ocean, but the plane -- an MD-80, I believe -- is descending. I can see the ceiling is extremely low, it seems we have maybe 50 feet from the water's surface. Suddenly, below the plane I see a strip of black basalt. Within moments, the pilot downs the plane almost as if the engines were cut. We slam onto the basalt. I'm told it is a fairly routine landing. 12. West Branch Wilderness, Northcentral Pennsylvania: In late 1998, I transferred from Alaska to Pennsylvania to help the chapter expand its efforts across the state. "To fill the hole in the doughnut," as John Sawhill used to say, referring to the western half of the state, virtually the only place in the U.S. where TNC was not working. Then State Director Randy Gray and I heard about 3,00o acres of forest land in northcentral Pennsylvania, a private inholding in the Sproul State Forest, along and above the West Branch of the Susquehanna River. We were looking for a big landscape project like this and when we visited it for the first time, looking over the seemingly endless expanse of "wilderness," we said to each other "How could we not do this?" It wasn't an easy road, but it was the start of bigger landscape-scale conservation for TNC in Pennsylvania. We dubbed it the West Branch Wilderness, which is another meme that has stuck. 13. Podocarpus National Park, Ecuador: Our sights were set not just on expanding into new territory in Pennsylvania, but in connecting PA conservation to international projects and global issues. Together with Roberto Troya, currently director of international external affairs, but then Ecuador Country Director, I had the pleasure of managing a partnership between TNC (in PA and Ecuador) and Fundacion Ecologica Arcoiris in southern Ecuador to help protect the park, build capacity, and share learning between our programs. The focal point was shared migratory birds between the Pocono Plateau (one of the Conservancy's "Last Great Places," and Podocarpus. Being in the Park and meeting the local people on the ground who were striving to apply the latest conservation tools and techniques to protect this resource was one of the most rewarding and enlightening experiences for me. Podocarpus supplies water to Loja, the largest city in southern Ecuador, as well as livelihoods and sustenance for many surrounding villages and towns. I could easily suss the deep connection between biodiversity conservation and human well-being, which I had also seen in the Pribilofs and would see again in Indonesia (see below). 14. Raja Ampat, Coral Triangle, Indonesia: When I first went to Indonesia, working with our Global Marine Initiative, I was on a two-fold mission. First, to see this place that is a true gem of marine biodiversity and be able to communicate its value directly to investors and others; second, although I didn't know it at the time of planning, to reconnect my father-in-law to this place that had meant so much to him. The place lived up to its billing -- the most amazing diving and snorkeling experience of my life -- but again, it became more about the people. The Indonesians I met and their deep passion for protecting and living and working in this area. It was, again, a demonstration of the interconnectedness of place and people, of biodiversity and human well-being. Our local partners and local staff, local government officials and elder council members. Together, we were trying to find ways to make the triple bottom line of economy, environment, and community sustainable and viable for the long-term. It was no longer about protecting parks from people but for people and, more importantly, with the very people who stood to gain or lose so much if we got it wrong. 15. Finally, two short takes on systemic issues and change: Over the past six years I've been involved in a powerful transformation at TNC. From an organization whose stock-and-trade was land deals, mostly in the U.S. ("We protect land the old fashioned way," John Sawhill used to say. "We buy it.") to one that perceives fulfillment of its mission at a global scale and, simultaneously, at a local scale. As part of that move, we began shifting our fundraising efforts, under the direction of David Whitehead and Stephanie Meeks, to an unprecedented scale. The result was the largest capital campaign in the history of conservation US$1.4bn and one of the most effective and efficient fundraising organizations in philanthropy. We also started to shift the organization to embrace and articulate the connections between biodiversity and human well-being, identifying and, through storytelling and better quantifying those connections, articulating those connections. It hasn't always been easy, nothing important ever is, and we've probably lost some good folks along the way who weren't ready to move so fast to be a truly global institution in the service of a new kind of conservation. And TNC is by no means there or at the end of its journey to fulfill its global mission. But, in the words of current TNC chairman John Morgridge, "Don't underestimate the ability of the Conservancy to make big things happen." I'd expect no less from this group of talented and committed individuals. I have been honored to be a part of it for so long. I have many more memories of my 15 years with TNC. These are just a bunch that occurred to me on the train home Thursday night, and I'm not sure I've done these stories justice in the space this form allows. Oh well. What remains for me is the power of my collective experiences at TNC; the relationships I've built with passionate, empathetic, sometimes hard-headed brilliant people such as those identified in my earlier post (and many more who were not called out therein). And that collective power has caused a shift in my focus as well, a need to be even more connected to what William Easterly calls the "Searchers," the people devising innovative, local solutions to problems that may have a global impact if they are given the resources and freed to bring their enterprises to light. That's what I hope to bring to Ashoka when I get there in September, along with a striving for excellence and commitment to values that John Sawhill expected of us all those many years ago. Today is my last day working for The Nature Conservancy after 15 years. Last night, some colleagues threw a send-off party for me at Caribbean Breeze in Arlington, VA. It was wonderful to see so many friends from my time at the Conservancy: old (or should I say, long-term), new, and treasured. One dear friend, Karen Browning Gallardo, whom I've known for more than a decade, asked, "So what are your favorite TNC memories after 15 years?" For me, the Conservancy has been about two things: the mission and the people. Who can argue with the mission: to preserve the diversity of life on Earth by protecting the places that represent that diversity -- and that are essential to human and economic well-being, by the way. "We get results you can walk around on," said our late CEO John Sawhill (more on him later). I'm often asked why I stayed so long at TNC. It's the people (I think I may have said that in my earlier post). But when I think about favorite memories, the mission, places and people are linked, inextricably. My memories of work with TNC can be classified into three realms: places, people, and systems change. I thought of 15, not necessarily one for every year and not necessarily in this order, but close. Thanks, Karen, for the idea, and for some great memories of working together. 1. White Plains, New York: One of my early meetings with Texaco. Chapter director Olivia Millard and I met with their community relations director to talk about funding specific programs. They were having issues with Ecuador at the time, the result of some bad practices from 20 years previous. I realized they were serious about trying to do something different, something more environmentally and socially responsible (this before the triple bottom line was a meme). I asked if they had ever tried to speak with environmentalists in that country. No, they hadn't. What if I facilitated a meeting with Hugo Arnal, then our Ecuador country director? They were non-plussed. Could it happen? It did. A dialogue started. It wasn't always pretty, but we were building bridges. My oil biz in-laws and my greenie friends could both be proud (some of the latter were not, unfortunately). 2. Neversink River, New York: The Neversink River surfaced as a conservation priority and a team of us determined it should be a bioreserve, as it was then called: an integrated landscape protection effort comprised of a core area and buffer zones, and which considered and incorporated the surrounding human uses and impacts. We put together the financing for the initial purchase in short order, including funds from some well-healed fly fisherman. (I remember a long night of serious drinking after a day of serious fishing with Leigh Perkins, then chairman of Orvis and a TNC board member.) In a stroke of marketing hubris, I dubbed the place "The Birthplace of American Flyfishing," because Theodore Gordon developed many of the commonly used dry flies from that stream. People still call it that today (another meme). 3. Neversink River (again): Our big opening celebration of the Neversink Preserve and Bioreserve project, one of the Last Great Places. Then Conservancy president John Sawhill is there to cut the ribbon and glad hand with TNC members, do a speech and high-tail it home. "I have to be back for a cocktail party that Belle [his wife] is putting on. I can't be late," he said to me. I was his driver. It takes exactly one hour to get from the Neversink Preserve north of Deer Park, NY, to Newark Airport (okay, if you drive like me). After John's speech, I whisk him into the car and drive like hell. He's talking animatedly, asking me about my work, how things are going for me with TNC. Then he stops, drops off like a bad cell phone connection. I look over. His head is in his chest and he appears to be unconscious. (OMG, I thought, I've killed TNC's president!) I look at the clock. No time to stop. I look at the gas gauge, the light below "E" is flickering to life. No time to stop. I hold some paper up under John's nose, It flaps. (I didn't know he had diabetes and this was just low blood sugar moment.) I keep driving, get to the airport just in time. As I pull up to the curb, John bolts up, thanks me, and sprints from the car. "You'll go far in the Conservancy, son," says John. 4. Lower Talarik Creek, Alaska: My success with the Neversink led me to be recruited by Susan Ruddy, then state director in Alaska. At an annual meeting she cornered me and chatted me up about Alaska, a place that had always held an allure for me. I couldn't believe they were having trouble raising money for that world class flyfishing stream. At the corner of the bar sat Leigh Perkins (see above). I walked Susan over and introduced her to Leigh. We walked away with a $100K commitment. How'd you like to come to Alaska to finish this deal? "Would I?" I said, stammering like George Bailey. 5. LTC, Alaska (again): standing in the middle of the creek, flyfishing with some good ol' boys from Texas. My cell phone rings. "Hello?" "Scott, is that you? Where are you?" "I'm at work." "What are you doing?" "I'm standing in the middle of a flyfishing stream with a 9-weight rod and a prayer." "You have the best job in the world. Why can't I have your job?" 6. LTC (again): I've just spent the past two days flying in the back of mail planes from Iliamna to Port Alsworth and everywhere around and between, including one rough flight with a bush pilot who wanted to test my mettle (I passed), going from fishing lodge to fishing lodge promoting Lower Talairk Creek. We needed a final $50,000 to complete the deal. Before I left Anchorage I had sent our proposal to the head of a family foundation, at the request of one of the family members. At one of the lodges, I used their dial-up service to check my email. "You have a deal," he wrote. "A check for $50K is being cut today." I took the rest of the day off and went fishing. Thanks, Harry, wherever you are! 7. Central Park, New York City: My return to New York from Alaska came barely four months or so into my stay there. But this time I was part of the Alaska delegation at the "Second Great Party to Save the Last Great Places," an extravaganza put on by TNC and the Central Park Conservancy. Guests wandered from "ecosystem tent" to ecosystem tent, representing the Last Great Places, from Indonesia's Sulawesi to Brazil's Patanal; from the desert southwest to Alaska. It was a hot, late spring evening in New York and I worried about the troupe of Yup'ik Eskimo dancers we'd brought from up north. They weren't used to the heat, or the heights: we took them to the top of the Empire State building. Others worried about the sled dogs posing with Colonel Norman Vaughn; the dogs came from Long Island. 8. LTC (again): Flying into the creek from the Iliamna Lodge, 15 or 20 miles away. We circle the mouth of the creek, where the famous "rock" is found. 10-12 brown bears can be found in the pool, scarfing up the salmon heading up stream, followed by the trout, tremendous endemic rainbows that are HUGE. We land the float plane in the lagoon and all the bears disappear. Can't see one of them, although all around is just low brush and tundra. Where the F*%@ did they go? Coral reefs in the Indo-Pacific are disappearing twice as fast as tropical rainforests, say researchers. They have completed the first comprehensive survey of coral reefs in this region, which is home to 75% of the world's reefs. John Bruno and Elizabeth Selig of the University of North Carolina at Chapel Hill in the US compiled data from 6000 studies that between them tracked the fate of 2600 reefs in the Indo-Pacific between 1968 and 2004. They used the extent to which reefs were covered by live coral as an indication of their health. "The corals themselves build their limestone foundation, so if the surface of the reef is not covered with live tissue that is continually secreting it, the reef can erode fairly quickly," explains Selig. She and Bruno found that coral cover declined by 1% per year on average between 1968 and 2004. For comparison, tropical rainforests declined by 0.4% per year between 1990 and 1997 (Science, vol 297 p 999). Global X on social edge features an interview with Sam Goldman of d.light design who is launching a start-up to provide LED lighting to the poorest of the poor to replace dangerous and noxious kerosene lamps. Also, read Sam Goldman's blog: Let there d.light! Discovery Communications acquired TreeHugger.com last week in an attempt to build its green new media offerings on the cusp of launching its Planet Green channel. Discovery paid an estimated US$10M for the site, which "claims 1.4 million unique visitors a month and more than 50 writers around the world blogging about green news and products," according to the Washington Post. TreeHugger is Discovery's first acquisition under chief executive David Zaslav, who began in January and is shifting resources into new-media products as part of "a housecleaning and reorganization that will end up cutting at least 25 percent of the company's workforce and closing the Discovery stores." Nick Aster, one of the founders of TreeHugger, who now produces the Triple Pundit blog, wrote that the acquisition helps TreeHugger meet its goal of becoming "a real media presence and actually play a real role in 'mainstreaming' the basic principals of an ecologically conscious lifestyle." Still, it's a remarkable turn for the site, which started only three years ago. It certainly points to the growth in this space. What will this mean for green blogging and green lifestyle reporting? Only time will tell. This sounds like one of those conceptual art pieces John Lennon's widow Yoko Ono was famous for over 30 years ago. The piano on which Lennon composed his anthem "Imagine" is touring sites of violent death in an attempt to bring healing and call attention to violent crime. The Wall Street Journal (imagine seeing John Lennon on the front page of the WSJ!) reported this morning that the tour was organized by the current owners of the piano, singer George Michael and his longtime partner Kenny Goss. The pair bought the piano at auction from a private collector for $2.1 million. The tour includes anniversary appearances at the sites of world tragedies, such as the campus of Virginia Tech in Blacksburg, Virginia, New York's World Trade Center, the federal building in Oklahoma City, the Branch Davidian compound in Waco, Texas, and the Lorraine Motel in Memphis, Tennessee, on the 39th anniversary of Martin Luther King's assassination on the balcony of what is now the National Civil Rights Museum. It all started last November at Dealey Plaza in Dallas, Texas, on the 43rd anniversary of the assassination of president John F. Kennedy. The tour was conceived after the piano was showcased at the IMAGINE exhibition at the Goss Gallery in Dallas last year. "Imagine a world without violence, a world of peace. This sentiment echoes the lyrics to John Lennon’s 1971 song, 'Imagine,'" claims the Lennon Piano Tour website. 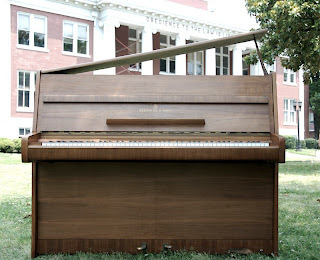 The Steinway upright is being photographed at each site for a possible book and documentary to "spread a worldwide message of peace, transcending time, cultures and boundaries." Like the "Free Hugs Campaign," the Lennon Piano Tour is a simple act that touches people directly with a message that speaks louder than words of protest. "This is about hopes and dreams and the world condition," Goss told the Associated Press last April. The tour will likely conclude in December in front of the Dakota, where Lennon was murdered in 1980. View a slide show of the stops along the tour: Lennon Piano. An RSS feed for updates is also available. Watch the video of the Imagine Piano arriving at the Clayton's home and being played by proto-blogger and singer/songwriter Steve Schalchlin. A moving tribute to a lost son.